Posted byMei 21 January, 2015 21 January, 2015 Leave a comment on Eczema News – Abdominal Pain and Allergy, Sensitization in Kids? 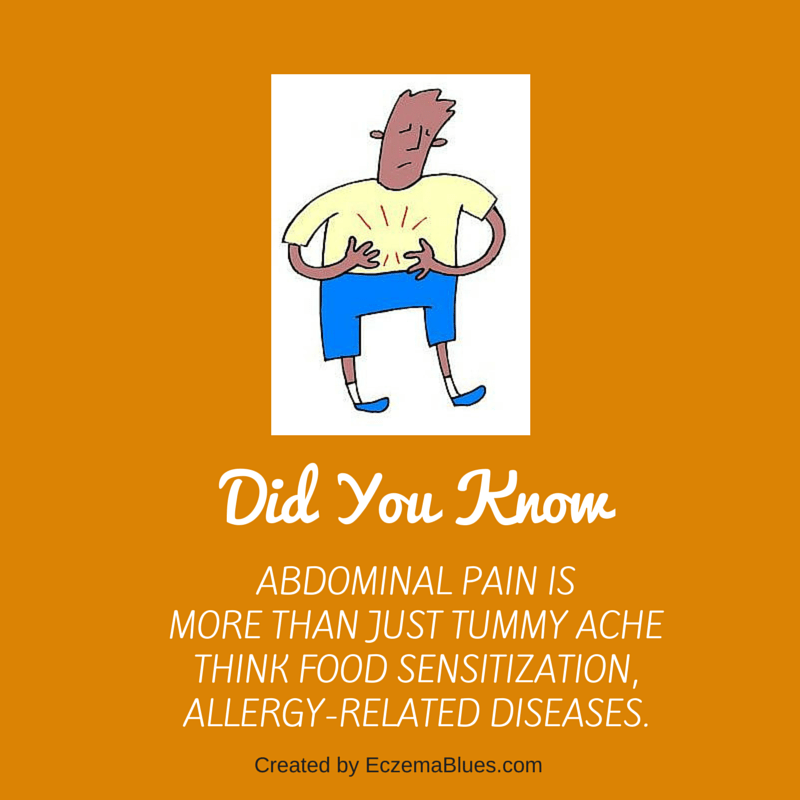 We’ve been looking at eczema research news for the past 2 weeks and this week, I came across an interesting study looking into the correlation between abdominal pain and allergy-related disease. My child sometimes complain of tummy ache and now I’m wondering if it got anything to do with her eczema. Let’s check out this study! Study objective: Examine the association between allergy-related diseases or sensitisation during childhood and abdominal pain at age 12 years. Study method: 2610 children in Sweden, using questionnaires. Parents answered questions regarding asthma, allergic rhinitis, eczema and food hypersensitivity and children answered questions on abdominal pain at 12 year old. IgE blood tests were taken at ages 4 and 8. Celiac disease and inflammatory bowel disease excluded. Why focus on Abdominal Pain? Recurrent abdominal pain affects 8% of children in western countries and often leads to school absence and lower quality of life. Multiple factors contribute to it, including irritable bowel syndrome (IBS). It’s also related to low-grade gut inflammation and the link to asthma, eczema and rhinitis had also been studied (with no conclusive result). What’s the Possible Link between Abdominal Pain and Allergy? Children with multiple allergy-related diseases may have a low-grade inflammation in the gut, resulting in barrier defects in the gastrointestinal tract, thus increasing the risk for disturbed motility and pain sensitivity. IBS patients with an allergic background have demonstrated increased IBS symptom scores, colonic permeability, mast cell counts and tryptase release or increased gut permeability compared to IBS patients without an allergic background. Conclusion: Among 2610 children with complete follow-up, 9% reported abdominal pain at 12 years. All allergy-related diseases were associated with concurrent abdominal pain at 12 years and the risk increased with increasing number of allergy-related diseases. Asthma at 1 and 2 years and food hypersensitivity at 8 years were significantly associated with abdominal pain at 12 years. There was an increased risk of abdominal pain at 12 years in children sensitized to food allergens at 4 or 8 years, but in stratified analyses, this was confined to children whose parents had not reported food hypersensitivity at time of sensitisation. My take: It’s not causal and admittedly, associations are not accurate. As pointed out in the study, it could be allergy kids already go to clinics more often or have increased anxiety and stress that lead to the recurrent tummy aches. But I do believe in benefits of a healthy gut – an area where increasingly gut influences more than just gut! Eat a low oxidation diet, fruits, vegetables and probiotics. What’s your healthy gut diet? Do you monitor the foods for your child with allergy, asthma, eczema or rhinitis? Do share in the comment so that everyone can hear from each other! Ask #Skinish Mom – Is it Wrong to Think I have it Tough?